TORONTO, ON – Two beer-related start-ups in Toronto – beer education and networking club Beerworking, and beer mail order service The Brew Box – have announced the launch of a new program that will offer a craft beer “sip & buy” service at a local farmers market. 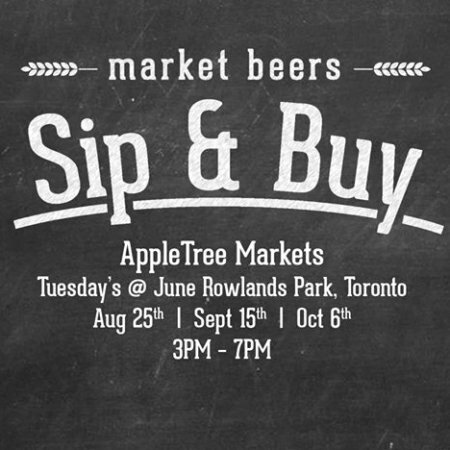 Market Beers will have a stall at the AppleTree Farmers Market in June Rowlands Park (Davisville Ave. & Mount Pleasant Rd.) on three upcoming Tuesdays – August 25th, September 15th and October 6th – where they will be serving samples and taking orders for home delivery of select beers from Beau’s All Natural Brewing and The Collingwood Brewery. For more details, see the Market Beers Facebook event listing.